Criminals rule the Gotham City night… but not for long! With sirens wailing and searchlights sweeping the streets, Batman and Nightwing ride out to drive evil form the city! 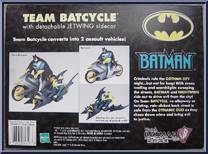 On Team Batcycle, no alleyway or twisting, rain-slicked back street is safe fro the Dynamic Duo as they chase down crime and bring evil to justice. Contribute pictures, update details or suggest corrections for Team Batcycle (Blue). 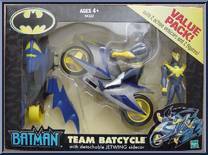 Write a review about Team Batcycle (Blue).